It’s so easy to get wrapped up in what we are asking the Lord for that we lose focus of everything else the Lord is doing during the wait. The last thing I want is to be so focused on God answering our prayers for babies that I miss everything else He is trying to teach us along the way. I truly believe the Lord is doing so much more in the spiritual realm that we can’t see or understand. It’s not just babies that He is bringing us – there is so much more going on! He is producing faith, patience, perseverance, hope, and character. I love how Romans 5:5 in the Message translation is stated above. There are not enough containers to hold everything God is generously pouring out. 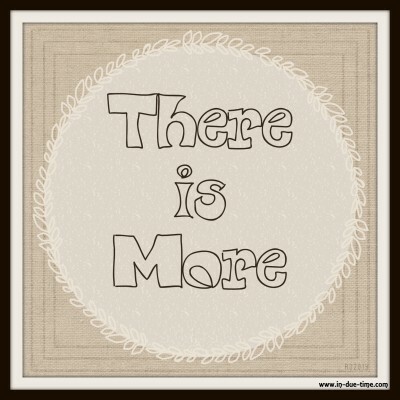 A song we sing at church has two lines that say, “There is more than our eyes have seen. There is more than our hearts can dream.” Isn’t that the truth? There is so much more going on that we have no idea about. He is generously pouring into us. He is allowing us to experience His endless love. He is refining us to become more like Him. He is working out 10,000 details, while we are waiting expectantly for Him to answer one. The Lord is doing so much more in us, through us, and with us than just answering our prayers about babies. Whatever you are waiting for, don’t be so focused on the end result, that you miss the whole purpose of the wait. God never makes us wait just to waste time. He is sovereign over waiting. 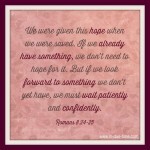 The longer we wait the more joyful our expectancy is! Make the most of your wait. Trust Jesus. Ask Him what He is trying to teach you. Know that He never delays. Believe that what the Lord does in you while you wait is more important than what you are waiting for. What is in Between Ask and Receive? I love how the message puts things sometimes! There are not enough containers! Yes, I know he wants us to see the big picture before seeing our own picture come into focus. We just have to keep our eyes and our mind open for whatever comes into view. Here you are in Romans again… never can get enough of the goodness in that book! Oh I just love this! So encouraging, and I especially appreciate that Message interpretation. As always, you lend such great perspective. 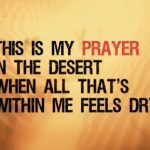 It is so easy to get wrapped up in whatever we’re waiting for that we miss out on the blessings of each day. You’ve got great perspective, as always. It’s so easy to miss out on the blessings of each day when we’re wrapped up in waiting for something else. Love this: don’t be focused on the end result. So often we forget that maybe, just maybe we are growing from the journey. And then the end can look different than we intended…and that can be better! When we are feeling overwhelmed by problems or circumstance, it can be difficult to understand why God has put your life in a holding position. But we do need to see what it is He is preparing us for. Yes we must live in the here and now, knowing the best is yet to come. The struggles and disappointments will often cloud and cover up the multitude of blessings in the day. We have to work to see past those. You are absolutely one of the bravest people I know. I’ve lived enough life to know you likely don’t always feel brave. But you ARE very brave. Awwww what a beautiful post. Thank you for the reminder. There really is beauty in waiting. God has beautiful plans for you. He is preparing both of you guys for all the surprises He has line up for you guys. God bless you both! Yes, God is always blessing us! Even when we don’t see it! LOVE this post, Caroline! 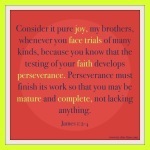 So encouraging! 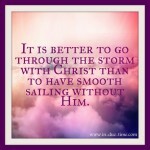 YES, it is so true that God is doing so much behind the scenes and under the surface!! He has been teaching my family and me SO many valuable life lessons through our severe testing and trials that we have actually reached the place to be thankful for the trials themselves. God loves us too much to allow us to go along without ever being taught what we need to know. He is a faithful God Who is absolutely interested in every, single detail of our lives. Thank you for sharing this wonderful truth!! waiting patiently is so hard!! it’s something i work on very often, because just when i think i am patient enough, i am tested. I can definitely relate to this! Sometimes I am so consumed in what I’m asking Him that I don’t focus on all the other areas He’s working in! This post was so appropriate for our family right now as well. We aren’t waiting for precious gifts wrapped up in a baby shaped package, but we are waiting (sometimes not so patiently) for our house to sell. Thank you for the reminder to enjoy the journey and be in the moment. This post is very appropriate for our family right now as we sell our house. Thanks for the reminder to be patient and enjoy the journey. This post is very appropriate for our family right now as we sell our house. love this. it is so hard to remember sometimes, but is SO GOOD. 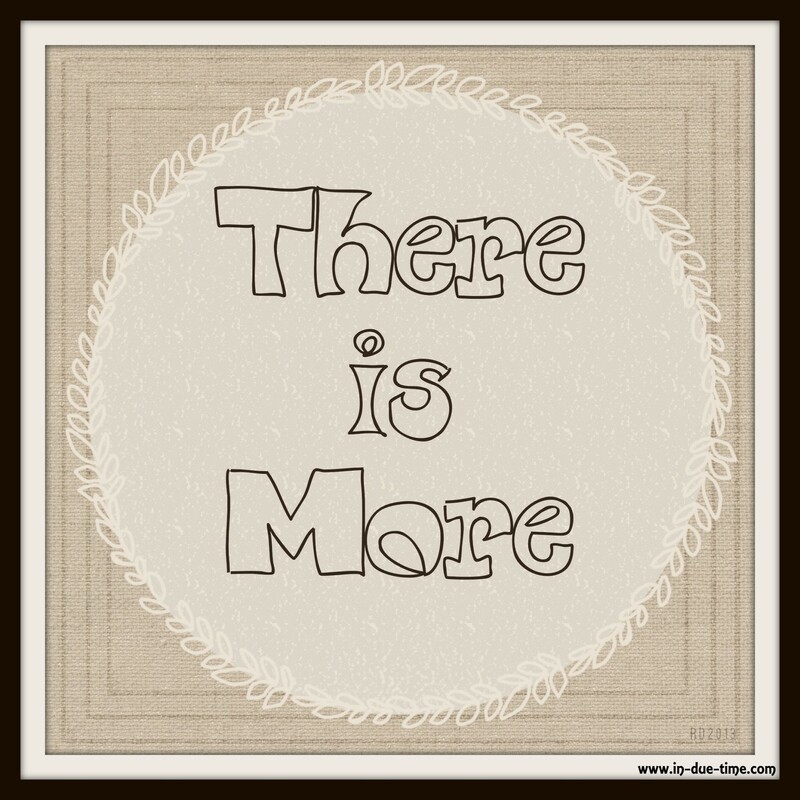 He does immeasurably more than we could imagine. I’m so grateful I found your blog and started stalking your fertility posts. I also have fertility issues but right now, we’re not pursuing anything. We’re just letting the Lord lead us. Love reading your blog. So excuse me as I go back to your older posts. 🙂 Thank you for sharing this to the world! 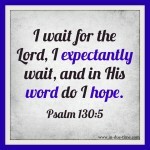 The waiting is the hardest part for me because I’m so impatient but He uses the waiting to work on my heart for sure! this is so true and such a great reminder. I’m looking forward to getting inspiration from your blog! I know that God always answers our prayers, we sometimes have to be still enough to hear it. Beautifully written post. What a beautifully written post. Although I’m now blessed with my little monkey I remember praying impatiently for babies. It’s a hard time but God is good and he has a plan for us. What beautiful encouragement and faith you have shared here! Unfortunately, patience is not a virtue I excel in. These are much needed words for me. Love this: “Whatever you are waiting for, don’t be so focused on the end result, that you miss the whole purpose of the wait.” I think I’ve missed a lot of purposes over the years from focusing on my goals :). This is so perfect! Infertile Myrtles is really struggling with the wait right now. I’m going to share this with them immediately. Thank you for writing this and putting those verses right in front of my face. Love you!